Cedar DNS II, I have had the pleasure of working with mine for 6 months now. Interesting that the DNS does not stand for Dynamic Noise Suppressor. Though it is Dynamic, the DNS II is a Dialog Noise Suppressor. In the right hands it is a wonderful tool for some things – in the wrong hands, well let’s just hope the wrong hands can’t afford it. Agreed, it does not at all remove the need for professional audio post – just too many subtleties that can not be addressed in real time and in the field. This is, in my opinion, not the responsibility of the Mixer. The DNS II lives alongside my SD 688. The excellent routing abilities of the 688 allow me to quickly choose what is being processed and then record the result on the last two tracks, in real time. All sources are ISO’d for the post purists. In addition, I am able to send what I call, “Quite Tracks” to camera and to Comteks. If the client needs minimal post they can use the QT’s. Their choice. Everybody gets what they need - but, and this is a big one, except the Mixer, still have not found anybody that wants to pay for it. They like it, want it, don't want to pay for it. However, they do keep calling. Can that make it worth it? One thing that has not really been talked much about is that the Cedar is not an either on or off device. You can ‘dial-in’ the amount of NR. The continuum runs from none, to quite pleasant, to ‘unnatural’ and on to irritating. For example, if the room has a overpowering echo, you can dial some of it out. But, if too much echo is removed it doesn’t sound like the room at all. One more tool to help with the mix. However, they do keep calling. Can that make it worth it? But is that because of you or because of your new toy? I use the CEDAR on the dubstage. It's the only noise reduction plugin I'll use on Dialog for broadband noise reduction. Sure. What do you think about getting tracks that have already been noise-reduced? My "sense of the meeting" is that it seems like PSMs who can afford this box are going to use it, on their mixes anyhow....the response here and elsewhere has been very positive. So, given that, would there be interest in an 8 channel version of this? 16 channel? No. Do not process tracks going to post. Period. With ever increasing track counts already, I think there would have to be a lot of benefit to doing the processing in production and doubling the track count to record unprocessed and processes. The trade off is a lot more time in post managing tracks, choosing which version to use when etc. Seems like that would waste as much time as it takes to just do the processing in post. Now if the noise reduction box had a way that worked significantly better in the field than in post, like mics in the room dynamically processing the background (hypothetical of course), then I could see the reason, but until something like that comes around, double tracking everything seems like more trouble than benefit. I haven't used the DNS though, so I'm just speculating. I think the general approach in production will be to utilize the Cedar DNS 2 on the mix track only, leaving any and all of the iso tracks unprocessed and available for post to work on if needed. I really don't see production sound mixers applying noise reduction on all tracks which would produce, as you have said, multiple tracks, processed and un-processed, it could be a real nightmare. One of the most useful aspects of the Cedar box that I have heard from people using it, is to improve the mix track even for the benefit of those needing to monitor in real time on the set. Following that, it could give the picture editor a cleaner track to work with before sound editorial gets their hands on your mix and the isos. and last but not least: cleaner mix to MY ears. It´s a relief believe me. Have been shooting with 2 Alexa65 for 90 days now I know my ears and nerves would have suffered way too much without the help of the Cedar. These cameras are pretty noisy since the second fan for the DSP is not going low in rec-mode. Without the DNS2 I only could have hoped / imagined that post-production will denoise my audio and safe the performance. By using the DNS on set I know ON the day, that my audio will be usable. Post might / will go again and use the isos to start with but this is several month ahead. Got a call in the beginning from the editor complaining about the noise floor. He was NOT using the mix-track but tried to build his own mix from scratch. I told him to do himself (and me) a favour and to use my mix. Haven´t heard from him since (well that might be for other reasons - hope not). I didn't consider using the DNS to help you set a threshold for what post can and can't easily take out later. Basically a live audition. That could be very handy. +1. a little bit like viewing log output with a monitor's LUT. If the DNS 2 can help you sell the on-set audio via IFB etc that's cool. I went through a period many years ago where we used expanders on the set in the same way some of you folks are using the little Cedar--esp re camera and BG HVAC etc. One caution I learned from doing this was that it can be easy to 1: mask issues in your monitor mix that you might could deal with directly (by turning stuff off, barneying cams etc) and 2: make assumptions about how post will go and what their taste might be (given the rest of the soundtrack components and the edit) about all this, that can turn out to be incorrect, and 3: slip into having the thing on all the time, and maybe in the heat of things succumbing to the temptation to push it a little too hard. Re: the concept of showing post and production what can be done with the tracks re: NR, sometimes it is actually important that the editors hear all that the posties will have to deal with in the dailies, instead of having that possibly be a surprise when the isos are finally listened to.... Finally, know that NR in post is done track by track (much of it by sound editing + mixing as opposed to signal processing), not on an overall mix, so the "modeling" aspect of the NR for post doesn't really work very well. lots of interest things being said here. Henchman, when you say you use Cedar do you use the plugin or the DNS2? It seems like you could also use it as a hardware insert in a post room setting. Anyone out there using it in the control room? Seems like a plush tool to have. If I had it I would definitely use it when called for. I think its great that you could take it to the control room. I end up doing some post work and use Izotope RX5. I'm sure it sounds different. I use a different Cedar box in my studio for post. So here's another location Cedar angle: a venerable DNS1000 working on an interview location equipped with The Devil's Own HVAC. The director is an ex-soundie and warned me the day before, so I worked over the Comtek feed with the Cedar to keep the creatives from panicing. A clean (ie dirty, non NR'ed) track was also recorded. Happy with how one can easily do a digital loop-around with the 633. I bought a DNS 2 shortly after it's release. I never have used it for the entire mix, what I have used it for is to turn my Sanken CS3e into a "Super Sanken CS3e". I guess I treat it more like an EQ knob for a boom channel than I do a final mix solution. I must admit that I have come to use a light touch, and I don't really push the limits of it's capabilities. Not every set is problematic, and location tracks shouldn't be sterile. I give post Deva files with two boom tracks (a processed and then a clean track), and they can use what they prefer. The processed boom track goes into the mix track. I have used this box this way on several projects including two lower budget features, and it's use in this way has met the approval of post so far. There have been times where it "saved the day", I once was hired to do an stand up interview on a factory floor, and the Cedar made an unusable situation usable. The client was willing to pay an extra $100 to me as not go to audio post for one shot. It small enough live in my bag, but it doesn't, it lives on my cart. My cart kit fee went up $50/ day after it's purchase, and my "cart clients" didn't seem to mind. My "bag clients" are a little more thrifty, and sometimes they need a Cedar too, but are less willing to pay for it, or have access to post plug-ins themselves. It is one more tool in the toolbox, my ledger book says it hasn't paid for itself just yet, but I am glad I have it. Interested in your routing the Cedar to the Deva. Signal cames out of my Lectro RX (wireless boom) into an XLR Y cable. The two males go into each channel of the DNS2. Channel 1 of the DNS2 (the channel I dial up the FX on) then goes into the boom channel my Cooper 308, then sent pre-fader to channel 2 of my Deva and labeled "BOOM DNS2". The signal in channel 2 of the DNS2 is run through unaffected, and is sent directly to channel 3 of the Deva, and simply labeled "Boom". I have the Deva on channel 3 set so I can control the level on the machine knob rather than the console, it frees me a fader on my 6-strip board. This way I can dial in the FX of the boom signal I am sending through the console to the mix on Deva channel 1 and have it iso'd on channel 2. I am also sending a clean boom on channel 3 should edit rather use it instead. Does that make sense the way I wrote it? Sometimes I'm not the best at this. I like the idea of the "light touch". On most of the demo videos I've heard of the DNS2 sounded like it was being pushed too hard (to show the diff I guess). The NRed sound sounded processed--tubbier, missing life in the top end. I'd rather have a bit more BG noise with less of those artifacts, which knowing Cedar I'm sure is very possible. I had an email exchange with Gordon Reid from Cedar, and learned (as those of you using the box already know) that it can stay in "learn" mode to deal with dynamic BGs. All right, Cedar! I know I don't use this unit to the fullest extent of its capabilities in the field. You could say that I use it more for a "digital EQ" to roll out things like bad HVAC and traffic on my boom channel. Got it, that certainly is one way to do it. Was wondering if you brought the boom signal into you board and then sent to Cedar with a send then bring back into Deva on a return. If a Mix is required either ch 1 or ch 11 (never both) can be used to build the mix. 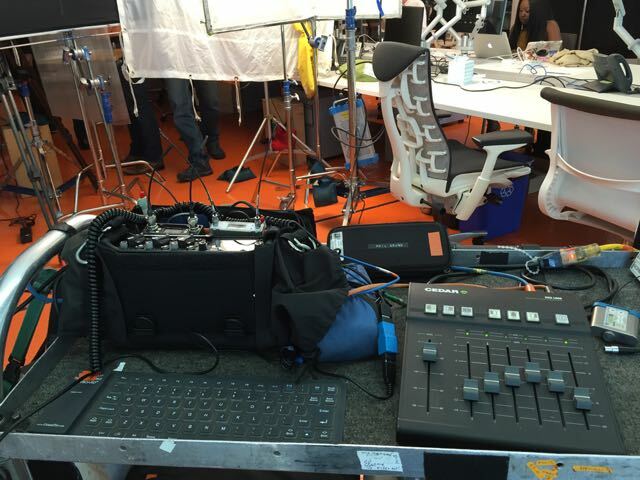 With single person interviews, split tracks of Ch 11 (QT-Boom) and Ch 12 (QT-Lav) are sent to camera. "Quite Tracks" are always sent to Comtek and to Transcription.